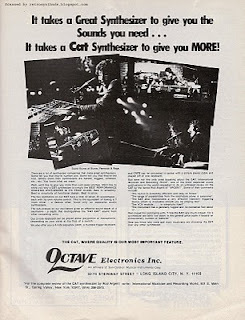 Octave Electronics CAT ad from page 45 of Contemporary Keyboard Magazine November 1977. Before this ad came around in November 1977, there had been three earlier CAT ads during the first half of the same year. I've blogged about each of those three ads (ad #1, ad #2, ad #3), mostly because I found them a little different from other synthesizer ads at the time with their creative illustrated imagery. But this ad takes the promotion of the CAT in a new direction, and I'm pretty sure its not a good one. My biggest beef with this ad is actually a beef that spans all their ads to date. As a reader in 1979, I'd be coming across these ads in sequence. Sure, ad #1 may have come off as pretty cute with the illustrated CAT synthesizer in the jungle. But three ads in and three months later I think I'd be a little ticked that I STILL HAVEN'T SEEN AN ACTUAL PHOTO OF A CAT SYNTHESIZER. Then, finally, this ad comes along three or four months after dead silence, and what do I get - a new ad with CAT synthesizer action shots that are so small and blurry that they are pretty much useless. Just let me see a photo of the synthesizer. Please! And if that isn't enough, missing from this ad are two vitally important pieces of marketing - the actual CAT logo with the slanted 'A' that appears on the actual synthesizer, and the associated little paw print - both of which appeared in each of the previous ads. This ad also falls down in other ways too. "What's new in the synthesizer jungle." "No matter where you perform." "Give your CAT a play-mate." Now I have to read: "It takes a great synthesizer to give you the Sounds you need... it takes a CAT Synthesizer to give you MORE!" Plus, they include a sub-title near the Octave Electronics Inc. logo: "The CAT, where quality is our most important feature". Just not snappy enough for my tastes. Second - the text in this ad is way too small. And there is no reason for it - there is lots of white space. Which brings me to my third point. Third - the white space. You hear about white space all the time from graphic designers. Well, here is an example of white space abuse. I purposely left as much of the white border around the ad as possible so you could see just how much more space they had to work with. Where as the earlier ads were well-balanced, this ad comes across as unbalanced and top-heavy. They did start doing something right - they took a page from ARP and Moog and started using musician endorsements, including David Burns of "Burns, Renwick & Rags", and Rod Argent of "ARGENT". It's a start. It is no wonder that, as far as I can tell, this ad only ran once. In December, a new CAT ad featuring the CAT SRM came out. Will blog about that one later. Personally I find direct shots of synthesizers quite boring, but, of couse, they are esssential for advertisement of new device: buyer needs to know the whole look, dimensions and which controls are available. Perhaps they thought about how cool synth hero photos are, and if there will be not one, but four of them, it will be better. Nicking whole point of actual buyer, not just synth enthusiast. As synth-hero photos they are great - lots of synths and energy, but they would be more at place in album booklet. By the way, I found nothing on Burns, Renwick & Rags on the Net. It's interesting, - was it a real band?